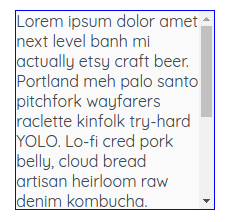 The CSS overflow property specifies what to do in the case a content is too large to fit in the container box. 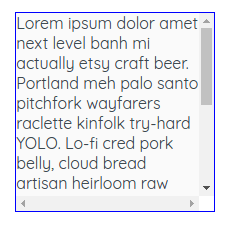 It specifies if a scrollbar should appear, or if a content gets clipped. The overflow property is a shorthand for overflow-x and overflow-y. The overflow-x property specifies handling the overflow in the horizontal direction, while overflow-y specifies handling the overflow in the vertical direction. When learning about this, it is useful to know a little something more about positioning. auto - the browser determines how it will handle the content, it can vary from browser to browser, but generally, scrollbars appear as required. The overflow property applies only to the block, inline-block and table elements. Now, let’s back this theory up with some examples. 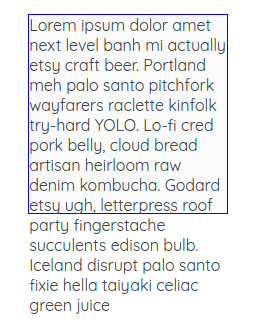 When working with text, it should have a proper formatting. 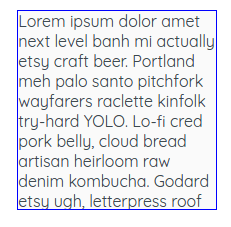 In the example above, we have set the overflow to visible and the content spills outside of the containing box. In the second example, we have set the overflow property to hidden. The content is clipped and no scrollbars are visible. In the third example, we have set the overflow property to scroll. In this case, the content spills outside the container, and the scrollbars appear. Finally, we can see the usage of the overflow-y property. We see only the vertical scrollbar is visible, while the horizontal scrollbar is hidden. In this short tutorial, we have explained the overflow property. Hopefully, it will be of any help when you start your next project. Wanna know more about CSS? We are glad to share - just subscribe to our newsletter.